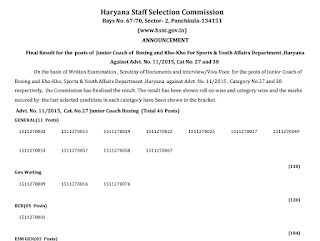 HSSC (Haryana Staff Selection Commission) has Declared Final Result. merit List / Cut off Marks for the posts of Junior Coach of Boxing and Kho-Kho, Sports & Youth Affairs Department ,Haryana against Advt. No. 11/2015 , Category No.27 and 38 .